Need help getting off the ground? Our team will help you implement PlanGuru based on your time and cost constraints. A turn-key service, where we build and maintain your budget/ forecast, providing you with the ongoing reports you need to make better business decisions. The core budget/forecast building application which includes an integrated income statement, balance sheet, and cash flow statement. PlanGuru provides over 20 forecasting methods which allow you to project for up to 10 years. These include intelligent, turn-key methods, plus the ability to build custom business drivers, including non-financial data. 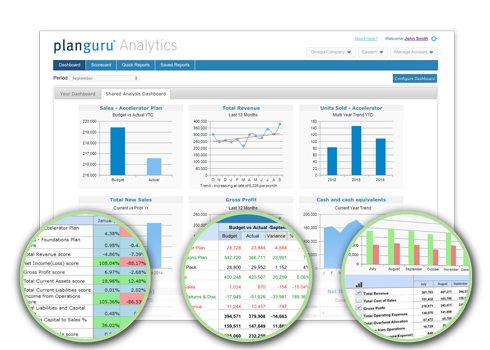 PlanGuru Analytics is a web-based dashboard and reporting tool that works in tandem with PlanGuru. Quickly provide clients and colleagues online access to view both high-level KPIs and detailed financial performance. This Excel based Add-in will allow you to build advanced reports in Excel using your PlanGuru analyses as building blocks. Integrate ratios, calculations, charts and other metrics into your reports, all of which can be updated with a click of the mouse. Windows Server 2012, Windows Server 2008 or Windows Server 2003 Server using Remote Desktop Connection or Remote Desktop Web Connection Client. Additional RAM is recommended when more than one user is running PlanGuru using terminal services. PlanGuru Analytics is a web based dashboard and reporting tool that works in tandem with PlanGuru. Advisors and Managers can now effectively collaborate without the headaches of printing and disseminating report packages. PlanGuru Analytics’ web based dashboards and reporting tools quickly provide access to both high level KPIs and detailed financial performance. Simply upload your data from PlanGuru then customize your Analytics dashboard. With built-in user management, you can easily share information securely and control access to as many additional users as you need. 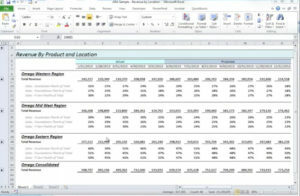 The PlanGuru Advanced Reporting Add-In allows you to build and run custom PlanGuru reports using Excel as your canvas. Users of this financial reporting tool will have a level of flexibility previously unimaginable. When combined with PlanGuru, this add-on module will allow you to create exactly the financial analysis you’re looking for. The PlanGuru Advanced Reporting Add-in allows you to create reports exactly the way you want to see them through a simple interface. Including Full Financial Statement Insert, Cash Flow Statement Reports, Non-Financial KPI Reports, and the ability to insert your financial statements and classes into the worksheet formatted according to your chart of accounts structure. The Advanced Reporting Add-in allows you to build and run reports off an unlimited number of analyses simultaneously. Build consolidating schedules, compare multiple scenarios and compile results from all your PlanGuru analyses, all within a single report. Build advanced reports in Excel using your PlanGuru analyses as building blocks. Integrate ratios, calculations, charts and other metrics into your reports, all of which can be updated with a click of the mouse. Your creativity is the only limit. Create truly dynamic reporting books and dashboards using the simple interface and familiar Excel functions. This is perfect for managers or professionals that need to run dynamic monthly report books.